Nicos Anastasiades (Greek: Νίκος Αναστασιάδης [ˈnikos anastasiˈaðis]; Turkish: Nikos Anastasiadis; born 27 September 1946) is a Cypriot politician who has been President of Cyprus since 2013. On 4 February 2018, he was re-elected for a second five-year term. Previously, he was the leader of Democratic Rally and a Member of Parliament for Limassol. Anastasiades is a lawyer by profession, and the founder of law firm "Nicos Chr. Anastasiades & Partners". He graduated in law from the National and Kapodistrian University of Athens and completed postgraduate studies in shipping law at University College London. During his university studies, he was a member of the Centre Coalition based in Athens formed by Georgios Papandreou. 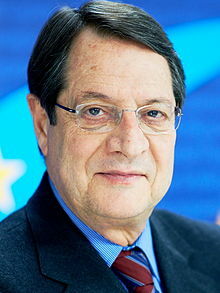 Anastasiades was first elected to the House of Representatives in 1981 and was leader of his party from 1997 until 2013. In March 2012, Nicos Anastasiades was nominated as a candidate for the 2013 presidential election, against his rival MEP Eleni Theocharous in a vote among the 1,008 strong executive of the Democratic Rally. Nicos Anastasiades received 673 votes (86.73%) and Theocharous received 103 (13.27%). In the first round of the presidential election on 17 February 2013, Anastasiades won 45% of votes, while Stavros Malas and George Lillikas earned 26.9% and 24.9%, respectively. He won in the second round against Malas with 57.48% of the vote and was sworn in as President on 28 February 2013. During his electoral campaign for the post of Cyprus President in 2013, he announced his commitment to reduce military conscription in Cyprus to 14 months during the first hundred days of his term. During the early months of the Anastasiades administration there was important planning for the reduction of military conscription to 14 months in order to increase the incentive for 18 year olds to serve their conscription and to reduce the financial burden to the Cypriot state. Minister of Defence Fotis Fotiou announced that there would be a final decision on the reduction of military conscription towards late 2013. There was increasing pressure for ending military conscription due to the 2012–13 Cypriot financial crisis. In early August 2013, Minister of Defence Fotis Fotiou announced the reduction of military service, which was in the electoral manifesto of Anastasiades. He supported that national service will be reduced to 18 months in the first phase and decrease further to 14 months before the end of 2014. On 25 February 2016, it was decided by the cabinet to reduce the military service to 18 months for all conscripts who joined in the summer of 2015, and to reduce the service to 14 months for all those who joined thereafter. Anastasiades supported the Annan Plan for Cyprus, even though a majority (61%) of his party voted it down. Some of his intra-party opposition even called for Anastasiades to step down. Many party cadres were up in arms over Anastasiades' letter to the European Parliament alleging that the government trampled on free speech and human rights during the referendum's "Yes" campaign. The government cited the National Television Council's data that showed that the six parties supporting the "No" vote got as much air time as the two that supported the UN plan. The start of peace negotiations between Nicos Anastasiades and his Turkish Cypriot counterpart began in October 2013, attracting the interest of international media and world leaders including Barack Obama. He married Andri Moustakoudi in 1971 and they have two daughters. He has a twin brother and a sister. First Vice-president of the delegation of the House to the EU-Cyprus Joint Parliamentary Committee (JPC). Leader of the delegation of the House to the Association of Asian Parliaments for Peace (Asian Parliamentary Assembly (APA) since 2008). Leader of the delegation of the House to the Parliamentary Assembly of the Mediterranean (PAM). Leader of the delegation of the House to the Euro-Mediterranean Parliamentary Assembly (EMPA) (Parliamentary Assembly of the Union for the Mediterranean since 2010). Vice-president of the Executive Committee of the Cyprus Group to the Inter-Parliamentary Union (IPU). Member of the delegation of the House to the Parliamentary Assembly of the Union for the Mediterranean and of the delegation of the House to the Asian Parliamentary Assembly (APA). ^ ULUSOY, Kıvanç (2015). Doğu Akdeniz'de Güç Mücadelesi ve Kıbrıs Sorunu (in Turkish). International Strategic Research Organization (USAK). ISBN 9786054030989. ^ "Sayarı: "Anastasiadis solun adayı Malas karşısında yarışın favorisi görülüyor"". KIBRIS POSTASI. Retrieved 2018-02-04. ^ "Anastasiades & Partners". Cyprus Law. Archived from the original on 12 October 2012. Retrieved 25 February 2013. ^ a b "Index". Anastasiades. Archived from the original on 3 March 2013. Retrieved 25 February 2013. ^ "Nicos Anastasiades". Economist Conferences, CEMEA. Archived from the original on 6 April 2013. Retrieved 25 February 2013. ^ "Disy picks Nicos, Nicos Anastasiades, Disy, Eleni Theocharous". ISG. 19 March 2012. Retrieved 25 February 2013. ^ "Nicos Anastasiades winner of first round of elections in Cyprus". Nasdaq. Retrieved 25 February 2013. ^ "Bailed-Out Cyprus Banks Feel Good Now, Depositors Don't". The National Herald. 3 July 2016. Retrieved 16 April 2017. ^ "Δέσμευση Αναστασιάδη για μείωση της στρατιωτικής θητείας μειωση, στρατιωτες, δεσμευση, θητειας". Axortagos. 23 January 2013. Archived from the original on 12 April 2013. Retrieved 25 February 2013. ^ "Government cuts army service". Cyprus Mail. Retrieved 4 April 2016. ^ George Gilson (30 April 2004). "'No' shakes Cyprus party politics". Athens News. Archived from the original on 17 February 2013. Retrieved 25 February 2013. ^ "Great opportunity to resolve Cyprus problem: Obama". Cyprus Mail. 9 August 2013. Retrieved 16 October 2014. ^ "Presidency of the Republic of Cyprus - Curriculum Vitae". Archived from the original on 5 April 2013. Retrieved 9 April 2013. ^ a b "Anastasiades Chr. Nicos". Parliament. Retrieved 25 February 2013.